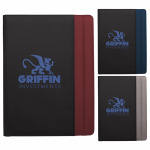 This padfolio features an interior organizer and an overall smooth leather finish. This modern design is universal for everyone! Imitation leather cover with stitch design along the edge. Interior organizer with slip pocket and elastic business card pockets. Includes 8 1/2" w x 11" h writing pad. Product size: 9 1/2" w x 12 1/2" h x 3/4" d.
I'm interested in learning about the Vertical Stitch Padfolio. Please contact me.